As the "mock" in its name suggests, mock orange is not a true orange. But the citrusy smell of its blossoms is enough to invite comparison and inspire the common name. In the world of common plant names, "false" typically indicates that one plant is similar in some way to another while being, nonetheless, botanically distinct from it. Another example is false cypress. Mock orange plants are at their most attractive in spring. Unfortunately, they do not have much to offer during other times of the year and are not ornamental enough to qualify as specimen plants. Massed along a border, they can form a loose privacy hedge for summer. The blossoms are often used as cut flowers. The fragrance is a major selling point for mock orange shrubs, but not all cultivars are equally fragrant. Therefore, a good time to buy mock orange is when it is in bloom at the nursery so you can smell before you buy. Reading plant descriptions is helpful, there's no substitute for sampling the fragrance for yourself, especially because the scent is such a personal matter. Note that the flowers are most fragrant in the evening. These plants will do best in full sun to partial shade. The bushes generally blossom more profusely if planted in full sun. The mock orange shrub likes moist, well-draining soil. If you are planting your own mock orange shrubs, dig a deep hole. You'll need to accommodate all of the roots and spread them out. They are reasonably drought-tolerant shrubs once established. Don't let the soil dry out but avoid soaking it. These plants have a robust root system, so watering occasionally for older plants is fine. These plants are fully winter hardy. They do not require winter protection and can tolerate below freezing temperatures. They blossom in the spring. 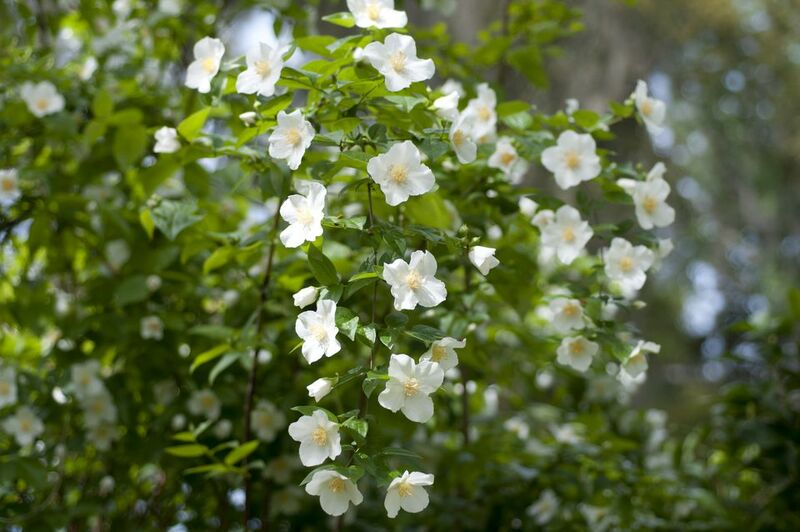 Use compost, bark humus, or manure when planting mock orange. In late spring, you can add more compost around the plant. Do not use a nitrogen-rich fertilizer. It can significantly increase leaf growth, which will hinder, or even stop, blossom growth. Aurea is a compact (8 to 10 feet high) cultivar with golden leaves. Variegatus'is even more compact, reaching a maximum height of 6 feet; as its name suggests, it sports variegated foliage of white and green. Another popular variety, Minnesota Snowflake (P. coronarius), and some of the other mock orange shrubs exude a citrusy fragrance, the quality of which varies by species and cultivar. The plants bear light green leaves and produce white flowers in late spring or early summer. Minnesota Snowflake reaches 8 feet tall and 8 feet wide at maturity. P. coronarius is listed as a somewhat larger plant (12 feet by 12 feet at maturity). Mock orange blooms on the prior year's growth. Therefore, to avoid missing out on flowering next year, prune the shrubs immediately after the blooming period. On stems that have just finished flowering, prune off growth above where you see outer-facing buds. Prune off any dead, badly positioned, or ill-formed branches. As mock orange matures it can become somewhat overgrown. At this point, you can apply the one-third rule, as you would when pruning lilacs. Each year, as you are doing your yearly pruning, prune the oldest one-third of the branches down to ground level. After three years of such pruning, the shrub should look healthier. Even if a mock orange becomes wildly overgrown, all is not lost, because the shrub, if healthy, will respond well to drastic rejuvenation pruning. In this case, prune in the spring before new growth begins, pruning all of the branches right down to the ground. You will not enjoy blossoms for that year, but all of the plant's energy will be channeled into the healthy new branches that will soon be rocketing out of your soil.